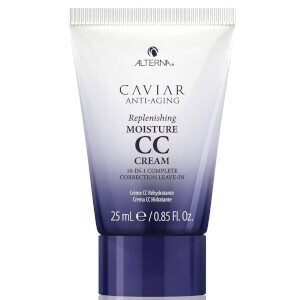 Treat your hair to the nourishing properties of Alterna Caviar Anti-Aging Omega+ Anti-Frizz Oil, a smoothing formula that helps to replenish and soften dry, brittle hair. Delivering a lightweight veil, the luxurious oil smoothens the hair shaft and promotes glossy, lustrous shine. Hair is left frizz free with a light-reflecting sheen. Cyclopentasiloxane, Dimethicone, Phenyl Trimethicone, Dimethiconol, Crambe Abyssinica Seed Oil, Helianthus Annuus (Sunflower) Seed Oil, Laminaria Digitata Extract, Caviar Extract, Glycerin, Saccharomyces/Magnesium Ferment, Saccharomyces/Copper Ferment, Saccharomyces/Silicon Ferment, Saccharomyces/Zinc Ferment, Saccharomyces/Iron Ferment, Phospholipids, Superoxide Dismutase, Polysilicone-15, Ascorbic Acid, Water (Aqua), Potassium Sorbate, Fragrance (Parfum). (10-16-35552).